The cross-sectional profile of a hull will determine the wetted surface and drag. Its distribution throughout the length of the boat will affect payload carrying ability and buoyancy. From the schematics at the top of page 117, one can easily see how the wetted surface of each type of hull section differs, yet retains the same cross-sectional area. 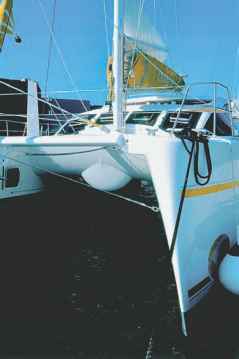 At one extreme, the deep V-type hull partitions, as employed by the Wharram catamarans, have 25% more wetted area than the contemporary type oval and semicircular hulls. Although the V-type sections offer excellent resistance against pounding and travel efficiently through the water, they are poor load carriers and are rarely used in today's industry. At the other end of the spectrum, the semicircular and elliptical canoe-shaped hulls have the least wetted surface for a given displacement; therefore, it takes minimum amounts of materials to build them. They rely on lateral leeway resisting devices, such as mini keels, daggerboards or centerboards, to be able to sail to weather. Between the two extremes are an infinite amount of combinations and possible hull sections, all necessary to support the weight of tons of boat above them, yet facilitating progress through the water as efficiently as possible. Narrow hulls will slice through the water with less disturbance and also have a lower moment of inertia. Yet they will also depress more and, in some extreme cases, also render less assistance in keeping the hulls from submerging. Designers are very careful not to take sharp entries to the extreme, as they can create a lot of waves that reach higher and farther aft, often compromising the bridgedeck clearance issue. Deeper hull sections will have a motion that is gentler and less jerky than a full-bodied, flat-bottomed hull. In contrast, flatter sections will resist the heeling forces of the wind and pitching motion far better. Since the water that is displaced by the hulls must end up somewhere, it is the responsibility of the designer to insure minimal wave impact as the boat speeds through. 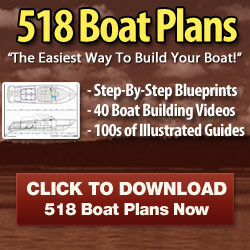 Sculpting the hulls, distributing the volume and determining the overall width and bridgedeck height, will all contribute to preventing the converging bow waves from hitting the passing boat. One can see there is a fine balance involving the entire design process, and the intricate shaping of a cruising catamaran's hulls must represent the culmination of all compromises. Whereas the hull section cuts the hull vertically, the water plane area is a horizontal slice at the waterline. It is important in influencing the distribution of buoyancy of the catamaran and is a key factor in characterizing pitch, stability, and load carrying capacity. Many manufacturers employ very sharp bow sections with very little or no stem volume. In extreme conditions these forward sections work the hardest in keeping the stems out of the seas. Making them too fine can be dangerous. It should be noted that for a given length, the finer the hull beam ratio of a boat, and the fuller the stem section of the bows can be. 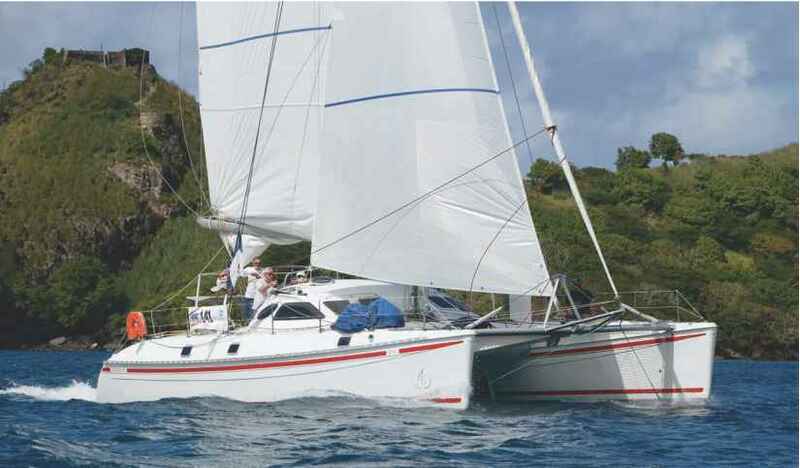 The Outremer is an extreme example of this characteristic and features massive bows. Although they create more low speed resistance and wave making, big stems and a lot of buoyancy forward will permit the boat to ride with a nose up attitude when highspeed surfing in long seas. The '80s experienced an interesting movement and the bulbous bow came into fashion. Many builders even retrofitted their stems and added underwater bustles of varying shapes. The late Australian designer Lock Crowther, who initiated this concept, realized the advantages of adding volume forward of the stem. The bulbous bow would act as a streamlining device to reduce drag. Interestingly, commercial ships around the world have been using this innovation to improve efficiency for years. However, it is questionable if smaller cruising catamarans traveling at varying speeds through relatively tumultuous surface water actually would benefit from the bulbs. On the other hand I can imagine the snagged lobster pots and driftwood that would get caught on a bow bustle which, in my mind, are significant disadvantages. An interesting bow shape was developed by French naval architect Christophe Barrot, designer of the Catana range of cruising catamarans. I am sure that the influence of the boatyard's former designer, none other than Lock Crowther, also played a role in that innovation. The sections of Catana's stems look like a highly subdued bulb. above Fine, elegant hulls are swift but will limit inside volume and payload. Note the emergency rudder-access deck-plate which can quickly be opened to fit a tiller directly to the top of the rudder post. 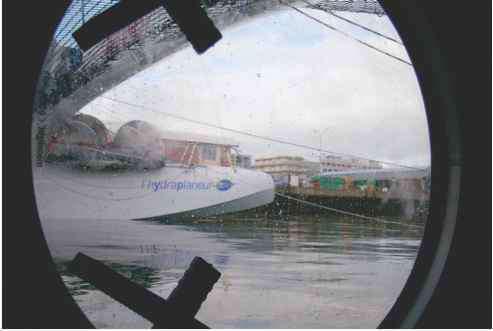 below Photographed from the emergency hatch, the radical hulls of "Hydraplaneur" show a pronounced chine and an underwater knuckle midships, similar to hydroplanes from the '30s. These features reduce resistance by lifting the boat out on an earlier plane than more conventional hulls. 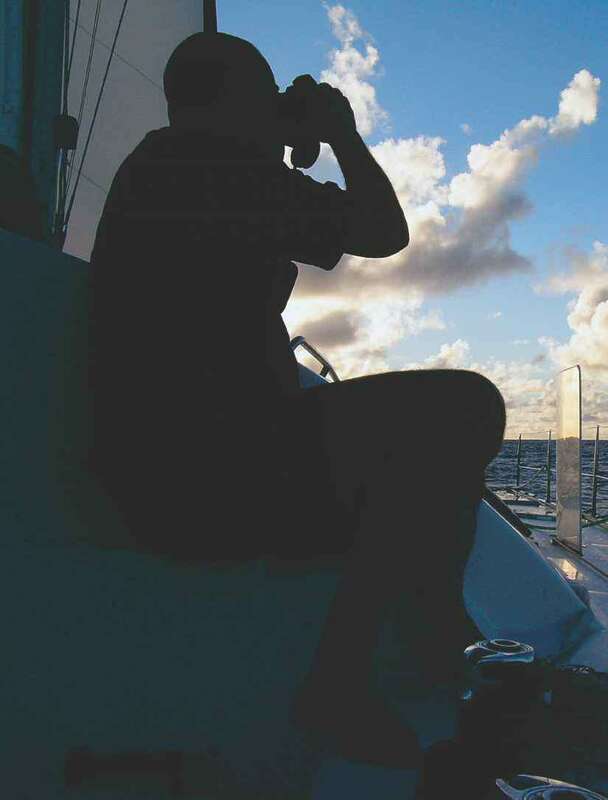 Disadvantages are a very wet ride and some pounding when sailing upwind. They are tulip shaped and what starts as a voluminous entry at the waterline tapers upwards and then flares out towards the decks. The idea behind this is to increase the buoyancy of the bow section to reduce pitching, which further helps increase boat speed. Every single time the boat plunges, it creates not only more resistance but the airflow over the sails detaches and creates turbulence. The Catana's hulls are also canted outward, which help the boat's stability, but some people might find them awkward looking from some angles. 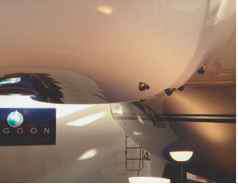 Another innovative hull shape is the one of British designer John Shuttleworth, as seen on the Tektron 50. He uses a flare almost along the entire length of the hull above the waterline to increase its volume, yet keeps the waterline beam to a minimum. It makes me wonder why we do not see more of these innovative hulls. Freeboard is another important compromise between providing ample standing headroom for the crew on one hand, yet keeping weight and the vessel's Center of Gravity as low as possible. A disproportionate amount of freeboard, especially in lighter vessels, can create a host of disadvantages, such as difficulties in accessing low piers and unwanted windage, which can make slow-speed maneuvering difficult. Also, a massive freeboard looks unsightly and gives the boat a boxy look. as an air brake if streamlining considerations are not taken into account. Designers therefore try to restrict freeboard to the minimum necessary. 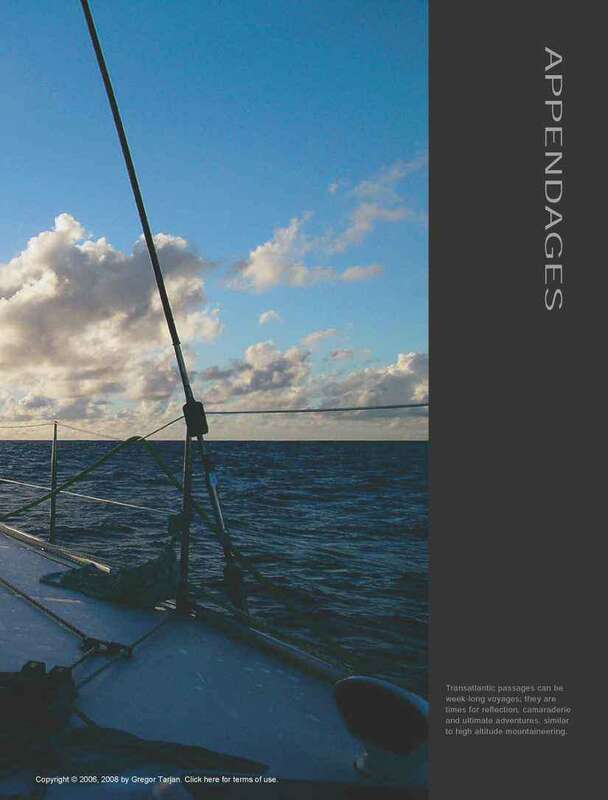 Windage can greatly affect a fast catamaran's performance and the wind pressure experienced by the vessel's hulls and superstructure can be considerable. One should not forget that the force is proportional to the square of the wind speed. This means that an increase in boat speed from 5 to 10 knots will result in an aerodynamic drag that is four times more. At 15 knots of boat speed the drag is nine times more than at 5 knots! Aerodynamic drag is comprised of several components, all hinder forward progress. The most insignificant is the friction of the surface of the boat as the wind blows across it. Next in line is the drag of the sails as they bend the wind into forward motion. Finally, there is parasitic drag created by the boat's structure itself. It involves every part of the boat: hulls, coachhouse, mast and rigging. 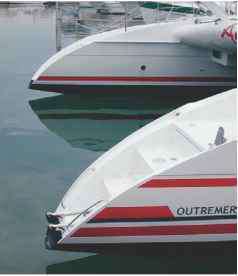 Therefore, the more optimized a catamaran's aerodynamic shape, the less drag and better speed. Keeping this in mind it is often surprising that there are still plenty of highly popular cruising catamarans on the market whose designers obviously disregard the requirements to streamline the superstructure. Although vertical windows create slightly more space in the saloon they make the vessel look like a tugboat. However subjective this criticism might be, the fact remains that bulky coachhouses have a decidedly negative effect on parasitic drag and significantly reduce a vessel's ability to sail to windward. left Basic hull shapes illustrate different wetted surfaces at equal displacement. The semicircular cross-section has close to an ideal ratio of draft, wetted area and volume. 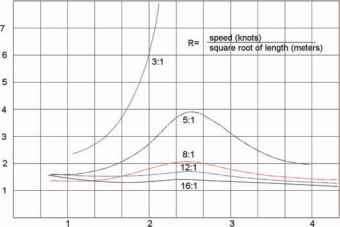 Resistance curves of equal weight vessels having different hull fineness-ratios show how the resistance wall at about 2.4 knots impedes wide bodied 3:1 b/l (beam/length) ratio hulls and actually prevents them from accelerating further. Slender hulls, such as 16:1 and even 12:1 b/l ratio vessels are hardly affected by this imaginary barrier. below The Catana's innovative bow section features flared topsides, a fine waterline and a bustle just below it - all contributing to optimizing its hydrodynamic properties. Do catamarans have more wetted surface? How to increase boat freeboard?